From New York to Detroit to Seattle, urban gardens are a growing trend. Here in Portland, city-dwellers are becoming full-fledged farmers; it’s not unusual to hear the bawk of chickens or even the bleat of goats. But for those who don’t want to go whole hog on the urban farming trend, Plantui’s latest Indiegogo campaign might be for you. 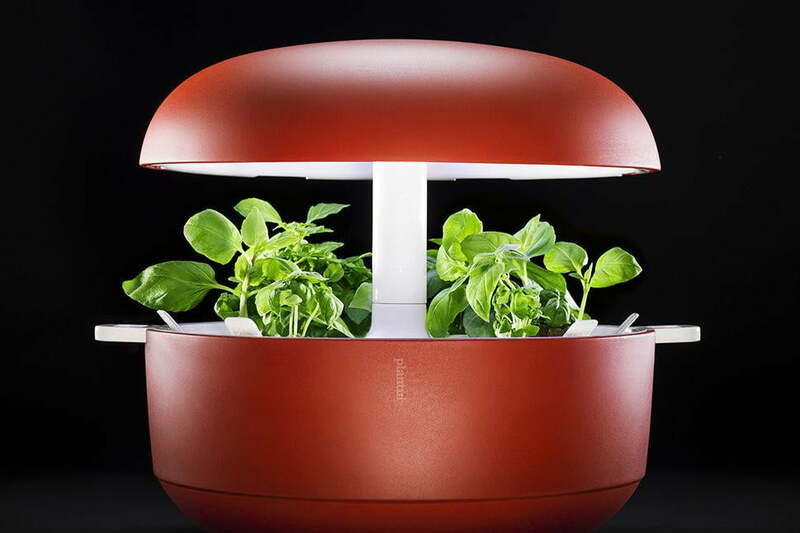 The Finland-based company already has a Smart Garden, a soil-free indoor device that uses light and a watering pump to grow herbs, salad greens, and edible flowers. Its second-generation smart garden, the Plantui Plantation, will support larger plants in addition to those options. Ideal for those lacking a green thumb, the smart device adjusts light and water according to the plants’ growing schedules. The plants come with a premeasured amount of nutrients and plant capsules for easy setup. Basically, you’d have to willfully murder your sproutlings if you want to kill these plants. If you want more control, the device connects to your computer, and you can fiddle with the settings. Basil, oregano, thyme, and rocket are amongst the herbs and greens currently on sale. With the larger-capacity second-generation model, users will also be able to grow tomatoes, chilies, and cucumbers. While it’s not quite as energy-efficient as letting nature do the watering and lighting, the Smart Garden was designed to run on a marginal amount of electricity. It should only cost $30 a year to power the device, even if it’s running continuously, according the product details. And with an output of over 40 pounds (20kg) of tomatoes in 120 days, you could even make a little cash on the side, selling your homegrown goodies to neighbors. If you participate in the Indiegogo campaign, the early bird price of the Plantui Plantation is $250. They’re expected to retail for $730 afterwards.